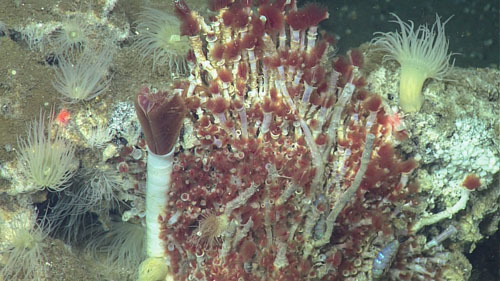 Lacking mouths and guts, these unusual worms survive by producing a “root system” that digests the surrounding bone and releases collagen and lipids to consume. The roots produced by Osedax also house symbiotic bacteria that appear to play a crucial role in nutrition. 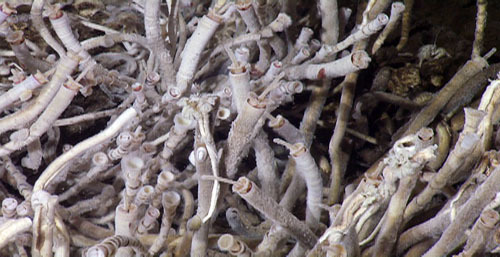 Since 2004, scientists worldwide have discovered 32 species of Osedax occurring at depths from 10 to 4000 meters. Various species are capable of colonizing a broad array of bones from fish, marine mammals, birds, turtles, and terrestrial mammals. These worms can consume bones very quickly, removing visual evidence of a sunken whale skeleton in as little as a decade. Osedax reproduction is particularly intriguing. With one exception, the known species produce “harems” of dwarf (microscopic) males that live within the gelatinous tubes surrounding a females’ trunk and do not feed on bone. The females accumulate more males as they grow, and some of the larger species have been found with “harems” with more than 600 males! Although extreme, male dwarfism is not unique to Osedax. Some spiders and species of marine worms, octopuses, barnacles and fish share this characteristic, which is believed to produce an advantage when finding a mate is very difficult (e.g., for sparsely distributed species that live in deep-sea environments) or when males and female would otherwise compete for a very limited resource (e.g., sunken bones). Osedax priapus (named for the Greek god of male fertility) is an exception, however. It produces bone-eating adult males that are nearly as large as their females. Why this species produces large bone-eating males remains unknown, but it is worth noting that this species has evolved from ancestors that produced dwarf males. Thus, it represents a throwback (or atavism) to an ancestral condition that is found in the nearest relatives of Osedax worms. Atavisms are extremely rare in evolution. 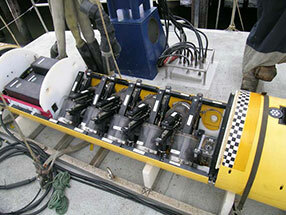 Our Osedax studies have led to new insights regarding carbon recycling on the ocean floor. Large food falls, like a whale carcass provides a huge pulse of food in an environment that tends to be food limited. The carcasses attract scavengers like sharks, hagfish, crabs, and smaller crustaceans such as amphipods who quickly consume the flesh. The exposed bones are then available to Osedax worms and bone-eating snails that digest the minerals and with the help of free-living and symbiotic microbes and consume the remaining organic compounds. Scientists have only begun to understand the ways in which carbon is recycled in the world’s oceans and its relevance to climate change.